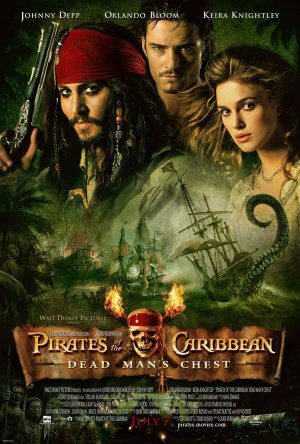 After the success of the first Pirates of the Caribbean film, Gore Verbinski and Hans Zimmer brought the music team back together to write the score for the sequel. The three pieces I have here are a pretty good representation of the sort of work I did on this film, though by no means is that all I did. I started by writing “Cannibal Island”. Once my introduction to that sequence was in place, the rest of the Cannibal Island scenes came together pretty quickly using a combination of Jack’s theme and my tune. The “Bone Cages” segment is a good example of this marriage of mine and Hans’ thematic material. You can feel Nick Glennie-Smith’s influence here as well. Then I moved on to writing Tia Dalma’s music. She has a small role in this film, but that little tune became a very big tune for the third film. In this one though, it was a subdued, moody, sultry swamp song.